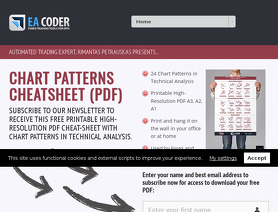 EA Coder programs automated forex trading software for the MetaTrader platform. EA-Coder.com's MT4 EAs Apps include Trendline Trader, Stealth EA, Candle Range Trader etc. for online currency trading. The forex tools from EACoder are supposed to do some of the jobs for you, copy trades and deliver trading signals for you. My name is Shoaib Ahmed and I am using this service since 2 weeks and I must say this makes my work easy. I have 8 accounts with different brokers and all trades which i place copies instant and installation is hassle free. I am not endorsing this software for any personal benefit. However, i felt the owner is doing a good job and his work should be recognize. Great system for accounts management. You wont need to open trades manually on each accounts. One master accounts can link all accounts together. Been running Local Trade Copier for more than a week now and I’m really impressed. Perfect solution to those who are limited in using an EA license to just one MT4 account. I’m using it to test different risk parameters to demo accounts to see which setting will be more profitable. One thing I’ve noticed is that to have the closest match of trades between MT4 accounts as possible, master account and client account should be of the same broker. It will still work with different brokers but expect the entry/closing points to be slightly different. I'm glad I really came across this EA. Easy to install and it get the job done. U should try it. I'm planning to get additional one. MyMT4Book and Equity Sentry EA: Visibility and Control for the win! There are currently two products I use from this developer: MyMT4Book and Equity Sentry EA. MyMT4Book gives you stats that MyFxBook cannot and allows you to tune up your trading by pushing what works and getting rid of what does not. Equity Sentry EA is the safeguard and supervisor of your MT4 accounts. It will allow you to automatically close your trades all at once if you life, based on rules (open loss, open profit, money, percentage or pips won/lost, etc...). Both fantastic products, both absolutely needed for any MT4 auto-trader. The visibility provided by MyMT4Book and the control allowed by Equity Sentry EA will make your trading better. This is my honest and hands on opinion. Worth every penny and the developer, Rimantas Petrauskas is responsive and very helpful. Well, I start using the Local Trade Copier since April this year, at that moment I was still a newbie and just purely use the basic setting to copy trades from other master account, until recently I discover that this EA actually is very powerful if you are creative enough to use it! Right now, I had upgrade my personal license to manager license to multi VPS of mine to use this EA! Thanks for creating a such EA to benefit to traders! Thank you! I'm using LTC copier and I want to say that it works perfectly, the support team is wonderful too, very quick!, good work LTC!!! Reviews page is not a good place for tech questions because our team does not monitor it. When I planned my trading business, I had trade copying in mind all along and of all the products I have reviewed, EA Coder has done a work of art with the Local Trade Copier. This is a must if as a trader you want to go beyond the many restrictions of having only one single broker account. Many brokers will restrict how many accounts one can have with them and almost all of them will restrict the permissible lotsize per transaction. This is the ticket to true wealth without having the hassle of manually copying your trades throughout all open accounts. What a time saver. Thank you Rimantas! I bought local trade copier. It is working very fast and advanced settings. Their help is fast and good. Happy with their solution.